Sid takes a tour of a place where everybody can grow food for everybody, free-pick Unity Gardens. 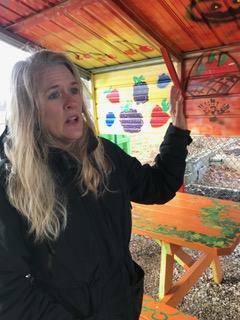 Sara, who started 11 years ago with a single plot on the near south side, now oversees gardens that stretch from Walkerton to Granger, with most of them where she started, in the areas of the greatest need for access to healthy food, in the poor neighborhoods of South Bend. With spring fighting winter over the soul of this gray day, Sara Stewart shows Beacon Health’s Sarah Walsh and Savino Rivera, and me, the lay of the land. It’s 9:00 in the morning and Sara is shivering with us in the damp cold. But it’s her energy that carries her three followers through the mist across the wet ground. “I’ve had the flu,” Sara tells us. “But, I’m better now." For the next hour she explains while we walk and listen. “Unity Gardens is where people come together and grow food for everyone,” she says. It’s not easy to count a number for “everyone.” It’s self-serve, 24-7, but the Garden Guides who documented evening visits last year in the active growing season counted over four thousand people, and Sara says they served 62-hundred in the programs, gardens and classes. with disabilities on East Jefferson. Altogether, 46. It’s a patchwork of humanity markers. In 2008, Sara was also teaching, teaching her St. Mary’s College students about the effects of poverty on health. On field trips to places like Hope Ministries, her students would tell folks they should watch what they eat, but then notice that choice was not in their list of daily opportunities. That’s when Sara told a homeless friend that she was considering starting a garden in the Studebaker corridor area, near where a lot of people sleep outside. Sara calls it her “ah-hah moment,” an empowerment model. “The garden is such a great equalizer,” she says. “We all look a little dirty and disheveled, so the person who is homeless looks just the same as the professors who come out here to pull weeds for an hour. Sara says that “ah-hah moment” led her to create an email list that grew from five on that day to 1,200 by the end of 2008. The annual Growing Summit of classes at the downtown library attracted 500 people a week and a half before my visit. Work and fundraising continues on a new Community Learning Center. One of Michiana Chronicles essayists, Jeanette Saddler-Taylor, regularly volunteers to answer phones during WVPE's membership campaigns. So, we’ve asked her to talk about that experience. If Michiana Chronicles is part of your Friday routine and your Friday wouldn’t be the same without it, please make sure you are a member of WVPE by calling 888-399-9873. Or, if you’re shy, as Jeanette claims to be, give online by clicking on the Donate tab. I have always considered myself a B+ pet owner. I don’t follow the year round flea and tick treatment and I don’t have my dog’s teeth brushed by the vet under sedation. Recently, work took me to Las Vegas, where I lodged at an off-strip hotel with a casino. I was there for a popular culture conference, and I found myself paying attention to the most popular activity in town. The casino, with its roulette wheels and blackjack tables, its keno screens, and its rows and rows of video slot machines, occupied a sprawling first floor. From the front lobby, you moved down to the Starbucks and then on to the gambling floor. Maybe you remember Andy Rooney, an essayist and commentator on CBS’s 60 Minutes? There is no way that I can compete with his voluminous eyebrows, but I often feel akin to his grumpiness. He didn’t have that Eeyore kind of hangdog grumpiness. You know, the “I don’t know, but I don’t think that’s right . . . “ style. Nooo, Rooney had a fire-in-the-belly, I’m-so-irritated kind of grumpiness that almost made his eyebrows flap in the stout wind generated by his ire. That’s my brand too: a fueled grumpiness. The kind that is fierce, judgmental and self-righteous. I came across a small, inspiring story this week, and then another, and another. I did not expect this. In our troubled times, with the climate rattling us up and down like a roller coaster we can’t get off, and politics pelting us like bad weather, I don’t often catch the aroma of fresh-baked inspiration. When I do, I slow down to take a look. First I noticed a page-long chapter in a memoir* by James Rebanks, a quiet episode where at the age of 17 he decided not to buy the car he’d been saving for. Interesting!